This morning, my friend, and “World’s Greatest Realtor,” Linda Grossman, invited some friends to join her volunteering at PSA McKinney, handing out flyers and promoting LOVE LIFE FOUNDATION. There is a fun run/walk coming up next Saturday at Adriatica to support this worthy cause. To further expose the plight of “at risk” women and children in our community and beyond by promoting awareness in our neighbors, family and friends, encouraging their generosity and inspiring them to become involved. To provide support, aid and hope to help these innocent victims learn how to love life. Me, Linda, Loretta and Julie. After our time volunteering, we scooted over to the Square for ARTS IN BLOOM festivities. This three day festival features fine artists, fun food and drinks, festive music, and more. 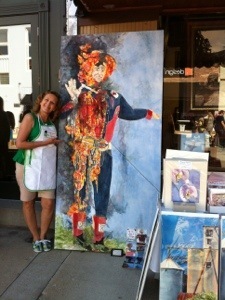 The best part for me was running into friends on the Square and visiting with many of my artist friends. Jenni Tomlinson, amazing artist and good friend. Lynda Kingsley had her beautiful watercolors and resin tiles. So many friends, so little time. Hi, Miss Annie Royer. Brad Donaldson displayed rows and rows of his amazing resin artwork pieces, furniture and paintings. Lisa Labarge is a phenomenal potter. I really need to take some classes. Such amazing work. Leslie Ortega and her clever and whimsical pet portraits. There were dozens and dozens of other booths and tents and friends to see. 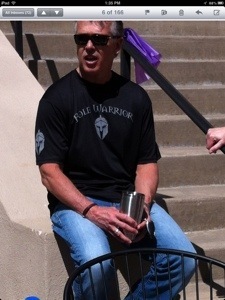 Linda and I got to talking to this young man, Clay. He was helping his family at their booth. Linda said the olde fashioned soda was amazing, so we had to try some. It was. 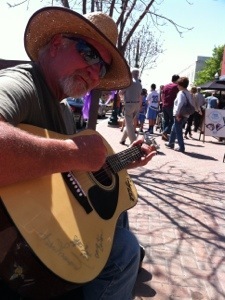 We chatted with Clay and told him about some of the cool arts and music venues in McKinney. He’s a musician by night and a mortgage banker for his day job that pays the bills. He’d like to venture out more with his singing. I told him that maybe he should sing his mortgage quotes and serenade his customers, then he could have the best of both worlds. Hmm…I don’t think he’s going to try it. Couldn’t hurt, though. After a LONG day of fun in McKinney, the four amigas stopped for some refreshments at Lone Star Wine Cellars, where we bumped into another group of friends. You’ve gotta love your community, because it always loves you back. Festivals promote diversity, they bring neighbors into dialogue , they increase creativity , they offer opportunities for civic pride, they improve our general psychological well/-being. In short, they make cities better places to live. It was a beautiful sunny day for the McKinney Arts In Bloom Gestival. A few days ago, the weather forecast was bleak, with showers predicted. Not a cloud in the sky today. It was perfect. 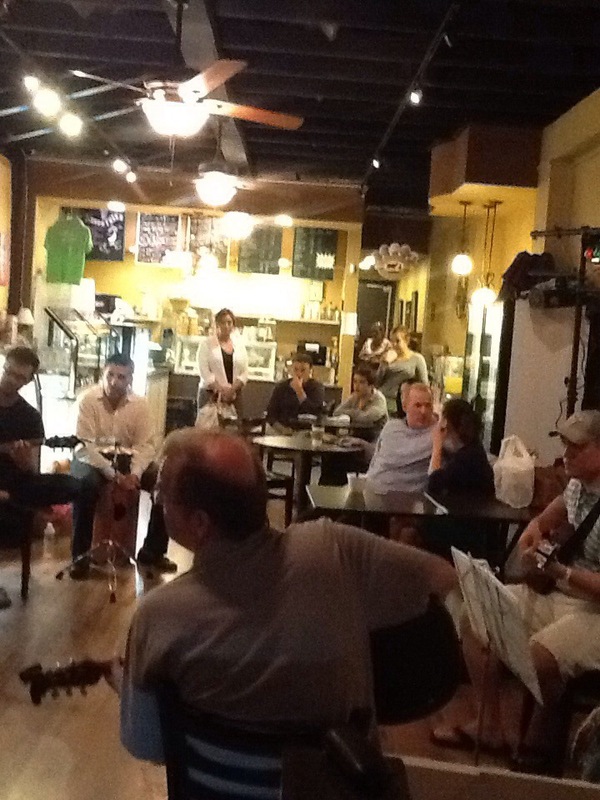 The great thing about McKinney and the artist community is everybody knows everybody. You can’t walk ten steps without running into friends, exchanging hugs, stopping to chat, and admiring amazing art work. I guess I’ll just show you the photos. Very self-explanatory. Steve Macias fired beautiful raku pottery all day, answering questions, and demonstrating techniques. Annie Royer painted expressive abstract art while the musicians played nearby. I’ll have to admit, the most popular spot was the wine tasting tent. It was mobbed all day. Personally, I have a strict no drinking and driving policy, so I did not partake, but there were a lot of folks enjoying the wine samplings. Then there were these two adorable little girls performing on the street. Now, wasn’t that a fun-filled day of art, fun and friends? YEP! 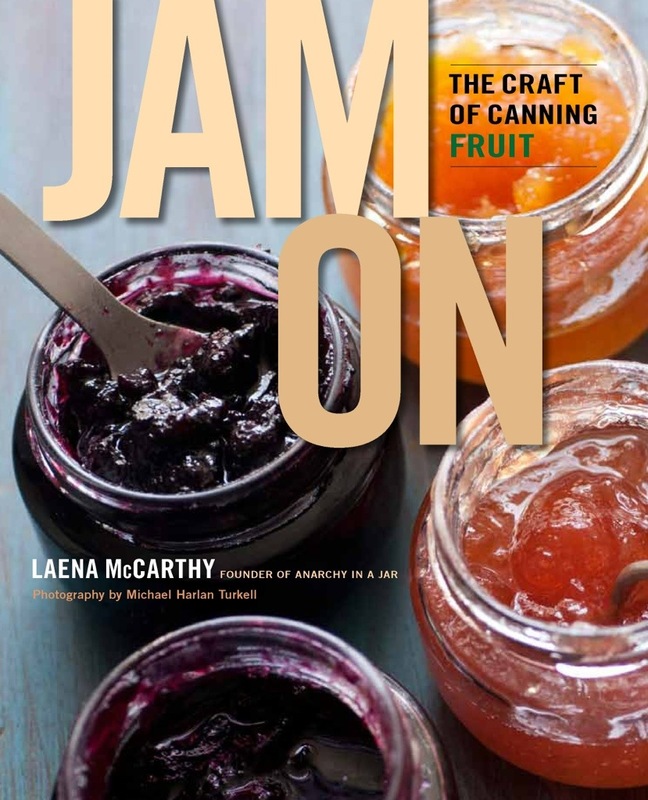 Telling stories and laughing with friends: precious moments you’ll never forget. A lot happening on the Square. 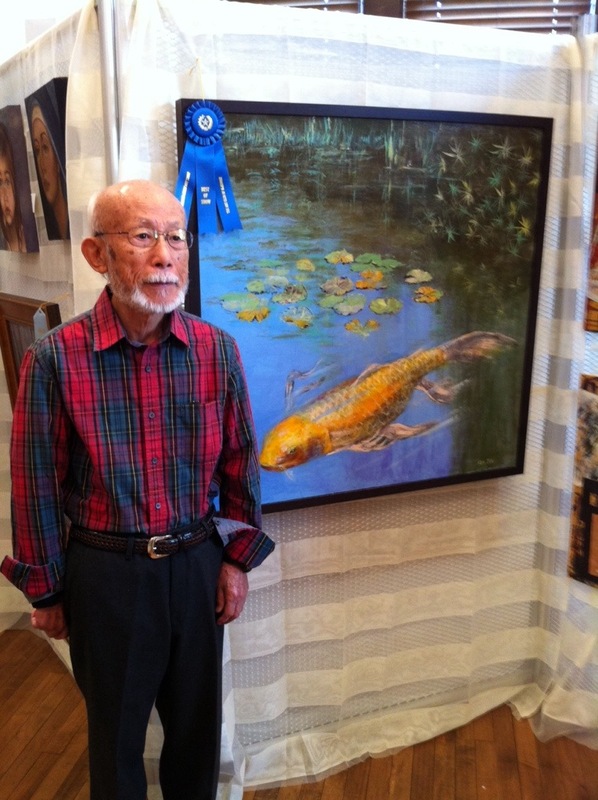 The Collin County Adult and Student Art Show was amazing. 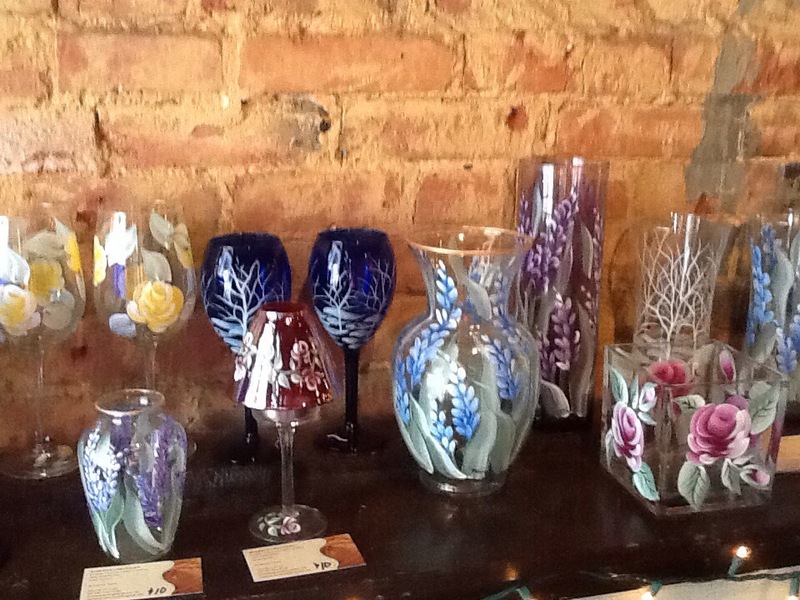 I was displaying my hand painted glassware at Sweet Spot for Arts in Bloom. So, I’d post more, but I’m busy singing along and tappin’ my toes. LATER!!! Saturday was just a blur. By mid afternoon, a blinding migraine headache ruined my exciting morning on the Square with friends. Thank goodness the sun also rises on Sunday. Starting the day with a great breakfast at Snug on the Square was a given. Tommy the wandering troubadour was playing his soulful songs as my friend Karen and I wandered around the Arts in Bloom event Saturday morning. We bumped into Mayor Brian Loughmiller at Snug and strolling around the Square. 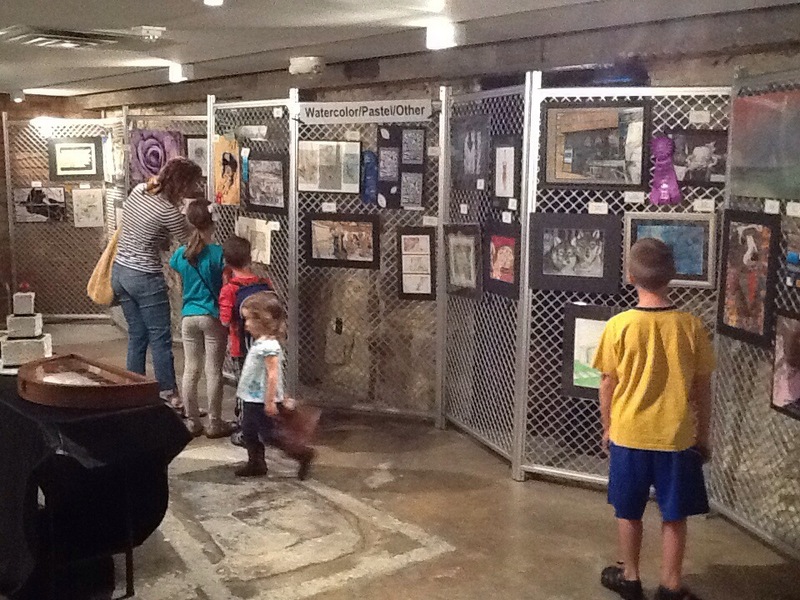 Dozens of our artist friends were displaying their works and talents. 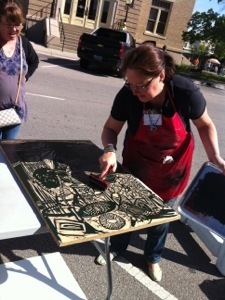 Lynne Hubner, an amazing printmaker, made prints of a huge woodcut by inking and pressing with a huge landscape water filled roller and children sliding over the paper in their socks. Way cool! 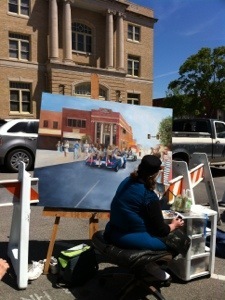 Jeni Tomlinson was painting a very large canvas of a McKinney May Day event from years gone by. Lynda Kingsley was at the state fair the day Old Tex caught on fire. She captured the event in watercolor for future generations. There were so many artists and crafts people, I couldn’t capture them all. Musicians were playing on every corner. It was great bumping into friends and enjoying a marvelous McKinney day.